Are extremely lightweight sound absorbing tiles made from high technology soft acoustic profiled foam material on a melamine resin base. White in colour they are designed to be bonded onto existing or new ceilings and high level wall surfaces, have virtually no weight and are very simple to fix. Foamsorption tiles are fibre and CFC free as well as having excellent fire resistant ratings. These tiles are used with great success in applications such as studios, offices, community and multi-purpose halls, cinemas, classrooms and shooting ranges for reduction of resonance. Due to its greater surface absorption allied with its low weight and Class 'O' non-flammability, Foamsorption tiles can be used safely in virtually any building. 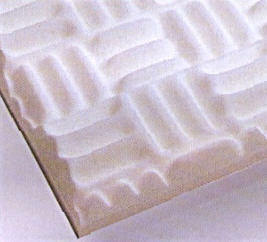 The special open face profiled foam pattern is the main reason why Foamsorption tiles outperform other acoustic tiles. 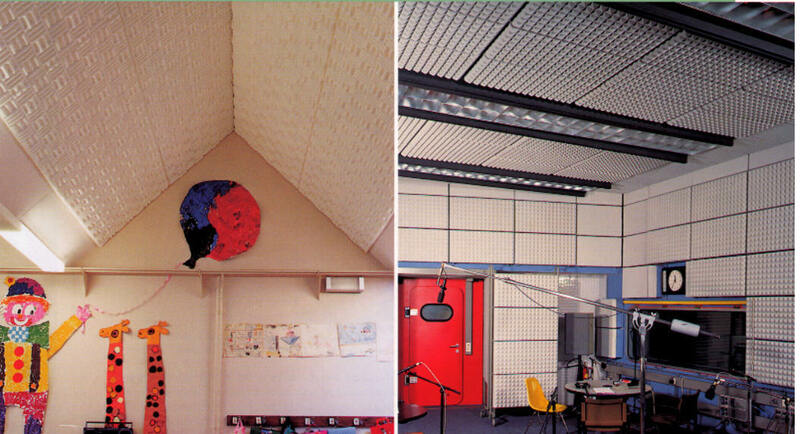 This leads to higher sound absorption in a building resulting in greater sound reduction.